Today, we began with presentations by Ernesto Verdeja and Susan St. Ville. Ernesto is the Director of the Undergraduate program in Peace Studies here at the University of Notre Dame. Susan is Director of the MA in Peace Studies Program. Both were helpful for navigating curricular questions and educational objectives of Peace Studies programs. A significant difference between graduate and undergraduate programs in Peace Studies at Kroc is attention to methodology. Peace Studies is interdisciplinary, which means that methodologies specific to a variety of disciplines – political science, social sciences, history, as well as qualitative and quantitative research methods – inform the discipline and shape the knowledge of peace studies. In addition to its interdisciplinary nature, peace studies equally values practice. Peace studies aims at effective practice for peace as well as is informed by practice for its theory. Reflective practice, informed by pragmatism and developed by Donald Schon, is one important method for peace studies for practitioners at the graduate level. In the afternoon, I spent time in a session learning more about the Catholic Peacebuilding Network (CPN). Jerry Powers, Coordinator of CPN, led the session. 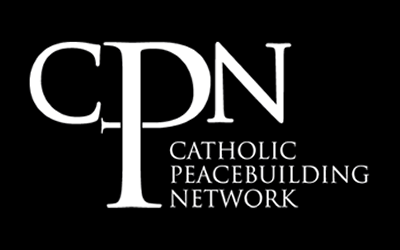 CPN is a network of academics and practitioners who seek to enhance the Catholic church’s unique role in peace building in the world. Leading projects and coordinating conferences, CPN enables a rich network of global academic, financial, and ecclesial resources to address conflict and peacebuilding in troubled parts of the world. The church’s unique capacity to affect peacebuilding at multiple levels – locally, regionally, nationally, and internationally – makes it an important tool for peacebuilding. In addition to the practical, CPN also develops the church’s theology and ethics of peace. I was very interested in a recent publication that Jerry helped edit, Peacebuilding: Catholic Theology, Ethics, and Practice, which included essays from among the finest Catholic scholars. At the end of the day, Priscilla Eppinger presented our (Priscilla’s, Tony Chvala-Smith’s, and myself) work product from the week. It is a working proposal for a Masters in Community, Justice, and Peace available through the Community of Christ Seminary. The vision of the program integrates our strengths: a foundation in scripture and theology, study in theory and practice of peace studies, along with content in areas of practical peacebuilding and justice-making in an online format. While its clear that several factors must come together to make such a degree possible, the aim of our work is response to the call to “equip people of all ages to carry the ethics of Christ’s peace into all arenas of life.” (Doctrine & Covenants 163:4c) This week with the scholars/practitioners at the Kroc Institute of International Peace Studies at Notre Dame and United States Institute of Peace has been integral for providing the guidance, relationships, and expertise to craft this possibility and see it possible. We are certainly not alone in this calling and must join those already at work in the field. Thanks to both Graceland University and Community of Christ for making this week for Priscilla, Tony, and myself possible. Today also began with important practical presentations in peace studies. David Cortright and Hal Culbertson presented “How to Change the World,” an overview of two courses they teach in the Notre Dame Peace Studies program. David Cortright spoke on non-violent social change; Hal Culbertson spoke to us about NGO’s. David Cortright is a peace scholar and activist. His books include Gandhi and Beyond: Non-Violence in a New Political Age and Peace: A History of Movements and Ideas. He is also Director of Policy Studies at Notre Dame; you can catch his blog at http://davidcortright.net. One of the most interesting and noteworthy items from Cortright’s presentation came from the work of Erica Chenoweth and Maria Stephan. They are co-authors of the book, Why Civil Resistance Works: The Strategic Logic of Non-Violent Conflict. Research by Chenoweth and Stephan concludes that non-violent social change works and is more effective than armed conflict. Their research argues that non-violent strategies create more stable democratic outcomes. Their empirical research on non-violent strategies for political and social change marks a decisive development in peace studies as a academic and practical field. You can learn more about their work in their recent article inthe most recent edition of the online journal, Foreign Affairs. Hal Culbertson’s presentation on NGO’s was plain and helpful. Many students with professional interests in peace studies will gravitate to NGO’s. NGO’s seem to be the “go-to” in “making a difference” in the world. While there are certain advantages and often overlooked disadvantages to NGO’s, Culbertson’s observations and basic outline of the components of an NGO – their theory of change, method and effectiveness of evaluation (outcomes must be measurable! ), management structure, and financing – informs a basic understanding of how NGO’s work, how they differ from other public and private institutions, and where NGO’s can go wrong. Hal Culbertson is the executive director of the Kroc Institute for International Peace studies at Notre Dame. Our final presentation of the day was a very important session on peace studies as a profession. Anne Hayner, who works directly with the 1,400+ alumni of the Kroc Institute, shared what career paths in practical peacemaking look like. Below is a chart created by John Paul Lederach and Katie Mansfield. A helpful and full explanation of the above chart can be found at http://kroc.nd.edu/strategic-peacebuilding-pathways. If you have any interest in peace studies as a profession, or believe peace studies is not a “real profession” with manifold professional opportunities, click the link and learn more. For the rest of the day, Priscilla Eppinger, Tony Chvala-Smith and I worked together on a proposal for an MA in Community, Justice, and Peace through the Community of Christ Seminary. Our work is still forming, and its results are provisional. Several factors must come together – resources, marketing, and institutional commitment – to make such a proposal possible. But, it has begun. It is both achievable and promising. The lasting effects of such an MA could be long-lasting for both Community of Christ and Graceland University. The practical resources for developing, improving, or beginning a peace studies program is a task given to every institutional participant of the Summer Institute for Faculty. We are among excellent colleagues. It’s been a privilege to be here and be a part.